The White-billed Buffalo-Weaver was formally described by Louis Jean Pierre Vieillot, a French ornithologist. Vieillot also gave a French name to this species, ie. Le Gros-bec noir a bec blanc (meaning The black Grosbeak with a white beak). 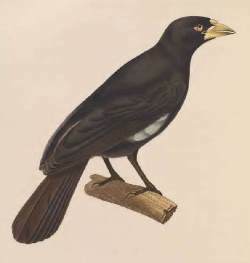 Vieillot described the plumage of the White-billed Buffalo-Weaver and listed it from Africa. The type locality was later restricted to Senegal, based on the amount of white in the wing of this species. This species was already described by Brisson 1760, based on specimens from coastal Africa, in the collection of Madame de Pompadour in 1754. Either Vieillot found these same specimens in the Paris museum and based his description on them, many decades later, or new specimens arrived from Africa. The first illustration of this species to be published, was by Temminck 1828, based on a specimen in the Paris museum, from Galam in Senegal. Again, there is the possibility that this is the same specimen as that of Brisson 1760, although Temminck provided his own name for the species. Coccothraustes albirostris	Vieillot 1817	Nouv. Dict. Hist. Nat., nouv. e'd., 13, p.535	Africa. Restricted to Senegal by Hartert, 1907, Novit. Zool., 14, p.485. albirostris Latin: albus, white; -rostris, billed. White-billed Nut-cracker (Swainson 1837) - for 2 decades authors used the French or Latin names of this species, before Swainson provided this name. African ox bird, Black Buffalo Weaver, Kavirondo Buffalo-Weaver, Kenya Buffalo-Weaver. Type specimen probably in the Natural History Museum in Paris.